We have students of all ages, and all levels of learning. The Kid's Class is for ages 6 to 10 years old. 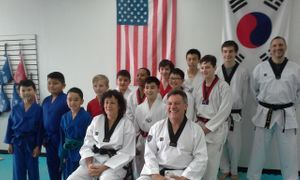 They learn Olympic Taekwondo, forms, self defense, and board breaking. We check their report cards and award accordingly. We have a behavior program in which the parents evaluate, also a citizenship program for making the area in which they live better. 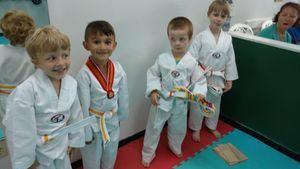 The Little Tigers class is for ages 5 to 6. They learn basic Korean commands, numbers, and basic self defense. They have their own belt system too. They also learn a basic form or two. The Little Tigers Class meets twice a week, Tuesdays and Thursdays from 5 to 5:30 pm. 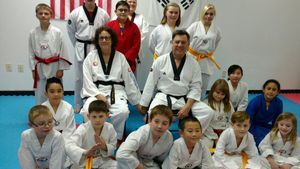 Day classes: Tuesday, Wednesday, and Thursday from 1:00 pm to 2:00 pm, all ages. 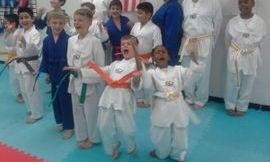 Kid's classes: Monday thru Friday at 5:30 pm to 6:20 pm, ages 6 to 10 years old. Adult/Teen classes: Monday thru Friday at 6:30 to 7:20 ages 11 and up. Little Tiger's class: Tuesdays and Thursdays from 5:00 to 5:30. Special Offer: 2 weeks of training and a free uniform for $40.00.